Am I the only one who buys multiple colours when finding a new favourite item of clothing? These striped dresses are from Joe Fresh (as are the boots and necklace, incidentally). I bought the orange one first and then went back for navy, since they are super comfortable, easy, and perfect for wearing to work. Somewhat embarassingly these are styled almost identically (At left, today's outfit. At right, one from last week). It seems I have to get a touch more creative when remixing these. To my credit, today I added the ultimate librarian it-item - a cardigan. Saw these dresses and got in my car and drove to Superstore. 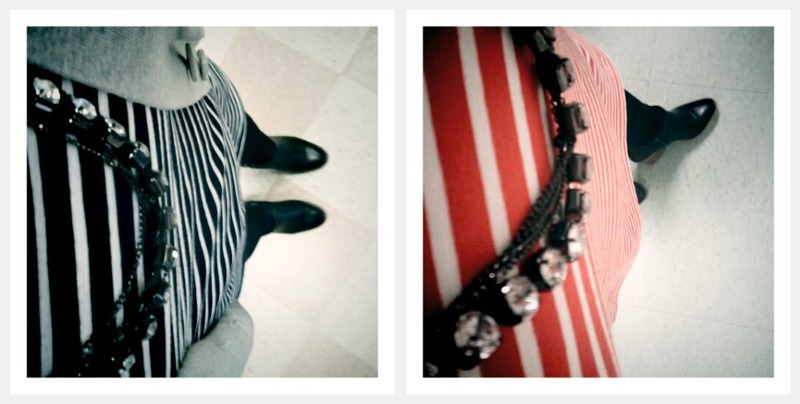 Bought a striped dress with an orange stripe on the bottom. Do you find that Joe Fresh always sells out of their M/L/XL sizes quickly? Some things only had XS/S left. Love the dresses - they're super cute! there are SO MANY awesome striped things at joe fresh right now!